But the amount was a fraction of what I was expecting, if I won the case. So I had to wait another week and a half before I finally received an explanation from Social Security. It was the judge's findings: "Partially Favorable". I had known I could be denied, and hoped I wouldn't be. But…partially favorable? It seems the judge agreed I had been disabled in 2011, but since I hadn't been to the doctor much in 2012, he decided my disability ended January 14, 2012 and so the money they sent was just for 2011, minus the "waiting" months. Obviously, this was distressing, as I still couldn't work. (I had explained in the hearing that the reason I didn't go to the doctor was I couldn't afford it, and the docs had all told me there was nothing else they could do, anyway.) So I contacted a lawyer who specializes in disability cases. The lawyer explained what I could do next. "You can appeal the judge's ruling," she said. "If you do, in no fewer than 18 months the ruling will be examined by the Social Security lawyers in Fairfax, Virginia, who will scrutinize it for any technical errors the judge may have made. It has nothing to do with your actual physical condition. If any mistakes are found, it goes back to the same judge, who will then correct the errors. It's almost unheard of for any such errors to actually reverse the judge's decision. And if his decision isn't reversed, the only thing you can do next is refile the entire claim." In other words, I was screwed. I would have to find a job, and work it, until I am old enough to get my retirement benefits, no matter how much pain I was in. Now, completely unrelated to this, last week I started hydrogen peroxide therapy for my arthritis. Hydrogen peroxide therapy claims success in an almost unbelievably wide range of ailments, from emphysema and arthritis to HIV and lupus. However, all these ailments do have in common that they are caused by anerobic cells: cancer cells, "bad" bacteria, and viruses that all thrive in the absence of oxygen and die in its presence. The extra oxygen atom in the hydrogen peroxide kills these critters when it encounters them. My arthritis is worst in the knuckle of the big toe on my left foot, which I damaged many years ago on a long hike in too-tight hiking shoes, and that's what I was hoping to heal. After all, that foot was subsequently damaged by the necrotizing faciitis, which only added insult to injury. Well, sure enough, after just a week of taking the hydrogen peroxide, that knuckle stopped hurting! That alone would have delighted me. But there was another, totally unexpected result. My damaged ankle has stopped swelling! In other words, I can now stand or sit up all day like a normal person. I am no longer disabled. While the judge was wrong, he was prophetic. I now can work! I have no idea how this happened, but it's happened now two days in a row. 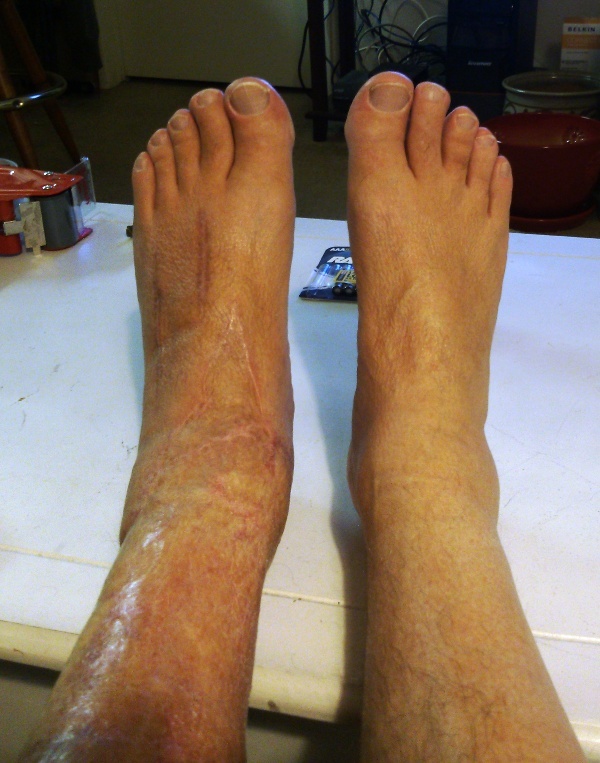 The docs explained that the transplanted skin on my left leg hadn't properly recreated the lymph system that drains excess fluid from the extremities, and that's why it swelled after a few hours, only to be restored by my lying down with my leg higher than my heart for about the same amount of time I'd been up. There are no bacteria involved. And yet, somehow…those fluids are now being drained. Obviously, this has nothing to do with bacteria, cancer, or viruses. And yet…there's been no other change to explain this result. Somehow, the H2O2 has done something to my leg so that it no longer swells, at least, not enough to be a problem. I am now up to 9 drops of 35% food grade H2O2 in a glass of water (the protocol says to add one drop to each of three doses a day, each day). However,most days I have only taken two doses, since it's so awkward to fit them between meals. And even so…amazing results!